In many cultures, religion can serve as the cornerstone of society- responsible for building schools, community outreach programs, and influencing systems of government that shape the very core of a country. As places of worship, these churches are often also some of the beautiful representations of art and architecture that a country can offer. Not surprisingly, churches are among the most visited sites for travellers in The Bahamas and, luckily, you won’t have to search too far or wide for these prized jewels during your visit. 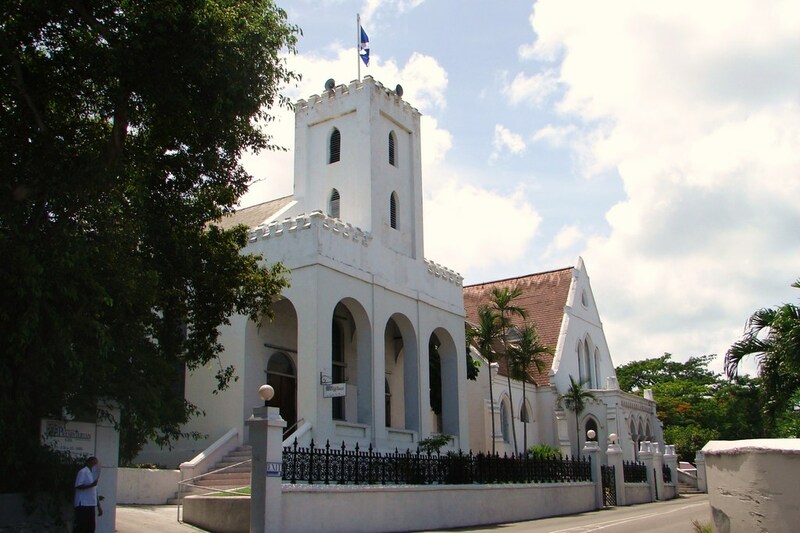 As the first established city in The Bahamas, Downtown Nassau contains many historical churches to enjoy a service at or tour through. Increasingly, these churches are popular as destination wedding venues as well for those planning a day of matrimony in paradise. During the Easter season, churches become the busiest centres in Downtown Nassau, which turns into a sleepy city on public holidays (Friday, April 19th and Monday, April 22nd, 2019). But even as the city takes a rest, Easter brings out the the best in social gatherings, with traditional Bahamian treats like Island Sweet Bread, Boiled Fish, and Guava Duff served at local fish fries and popular restaurants, and some of the most heartwarming church services you’ll ever experience- all within blocks of one another. If you’re going to be on the island during the Easter Holidays and are looking for a Good Friday or a Sunday sermon, or simply have a hunger for discovering historical gems (and a decadent Hot-Cross Bun), take a look at our roundup of historic churches to visit in Nassau! Known as the state church of The Bahamas, Christ Church Cathedral is the most famous, and most prominent, church in the Downtown area (and also the starting location of our Bites of Nassau food tour). With towering limestone-carved walls and striking Gothic architecture, the church is one of the pillars of the city. Interestingly, the church’s history is wrought with violence. Built originally between 1670 and 1684, the church has been destroyed, relocated, and rebuilt four times since its first construction on West Hill Street, a constant casualty of the war between the British and the Spaniards as they fought over the archipelago. Thankfully the church has settled on George Street, where distinguished members of society come to worship in the glow of stained glass windows and the sobering notes of grand pipe organs. Dark local mahogany wood ceilings and granite tile floors imported from Italy. Two grand pipe organs, one of which has been listed among the finest organs in the region by the American Guild of Organists Journal. Stained glass windows, the eastern panels having been installed in 1949, while the northern and southern panels were hand crafted by Statesville Stained Glass Company and installed in 1995. St. Andrew’s Kirk was originally founded in 1810 by a group of Scotsmen, many of whom had been relocated to The Bahamas in 1783 following the American Revolutionary War. The church was built to provide a space for the Scottish Loyalists to practice the rites and traditions of the Scottish Church. St. Andrew’s was the third congregation to be established in The Bahamas and remains the second oldest church in New Providence. Its Gothic design will attract architecture buffs and history enthusiasts alike, and the magnificent bells that chime by the hour continue to add a mystical aura of peace through our Downtown streets. This auspicious church is well-worth the climb up Mount Fitzwilliam! Gothic architecture, with arching windows, stained glass windows and antique chandeliers. Bordering the Downtown area is the imposing Bethel Baptist Church, the first church to be built in the neighborhood known as “Over-The-Hill.” This part of historic Nassau consists of small communities, namely Bain’s Town and Grant’s Town, which were originally set up to accommodate Liberated Africans following their arrival to the island during the 1800s. Bethel Baptist Church was first established in 1790 and remains the oldest Baptist church in the country and an integral part of the “Over-The-Hill” community. With its community-focused values and programs, along with the church’s beautiful choir and foot-stomping praise and worship sessions, Bethel Baptist Church is a treasure worth discovering during your journey through Downtown, Nassau. Tucked away at the bottom of West Street is a tiny church built especially for the growing Greek population here in Nassau. Established in 1932, Annunciation is seen as one of the best examples of Eastern European architecture in the Caribbean. The church boasts a small, octagonal Byzantine tower topped with a groined dome that harbours paintings of various saints. Stained glass mosaics and wooden panels also display saints and holy individuals, all illuminated by the light of grand chandeliers. Apart from its immense beauty, Annunciation Church is the central pillar of the Greek community in The Bahamas, where community meetings, dinners, and festivals take place, especially the highly-anticipated Greek Festival, which takes place every two years at the church. During the festival, the Greek-Bahamian community show off their food, wine, rum, crafts, cultural rituals and dances. Thankfully, the church is open to the public for free tours any day of the week. You’re even welcomed to their weekday services, which are given entirely in Greek! And since the Greek Orthodox Church celebrates Easter two months after other denominations, you’ll have a chance to potentially experience the Easter holidays twice here in Nassau. Peaceful gardens to relax in after a long stroll through the Downtown area! Nestled atop West Hill Street is the magnificent St. Francis Xavier Cathedral, the oldest Roman Catholic church in The Bahamas. Opened for worship in 1886, St. Francis provides not just one church to tour, but two, both the parish’s original structure and its new church standing directly next to each other for guests to view. The original church was built in traditional Gothic style, but the new church has a cruciform design and contemporary décor that draws inspiration from the older church, utilizing arched windows and doors, stained glass windows, and pipe organs that fill the church with the intensity only matched by the congregations’ various choirs that come together to create a service that fills you with awe. Both churches are a must-see, along with their lovely gardens and stonework, all with a gorgeous view of Downtown Nassau. Depending on when you’re traveling, the old church may be closed for construction, since most of the interior was destroyed during a fire in 2008, but the new church is worth the trip up West Street! Two beautiful church halls, the original church to the east of the property and the new church directly next door. Stained glass windows and grand pipe organs. Selection of three choirs, ranging from traditional gospel to vivacious praise and worship sessions!